Preached by Revd Darryl Stefanik in the seminary chapel. It is the blood of the Lamb of God that takes away the sin of the world. It is the blood of the Lamb of God that takes sinners and makes them saints. It is the blood of the Lamb of God that washes us clean in Holy Baptism and gives us a new identity: children of God. And so we are (1 John 3:1). And so in Christ, we are now what were not before: holy. And we are bold to make such a claim, because it is not based on who we are or what we do, but on our Saviour and what He has done for us, and given to us. And so it is sure, and certain, and true. For God never does anything half-way. He does what He says and delivers on His promises. 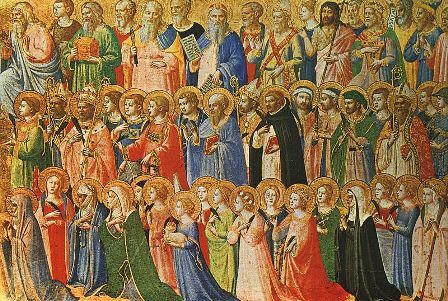 And so we celebrate this day—All Saints’ Day. A day not for the super holy, or super pious, or those better than the rest of us. No. It is a day for ALL of us. For all the saints of God, for all whose sins have been forgiven, who are gathered around the throne of the Lamb in worship and praise. Both those gathered on the other side of the veil, whom John saw, who have already received their rest; and those of us gathered on this side of the veil, whose saintliness is now hidden under the sin and struggles and persecutions of this world (1 John 3:2). But we are all one body, one Church, around one God, and one Saviour. Proclaiming the praises of Him who has called us out of darkness and into His marvellous light (1 Peter 2:9). Even here on earth, as it is in Heaven. And so we are reminded again today that this world is not all there is. There is, in fact, much more. What we see and experience now is but the tip of the great iceberg of the Church, most of which we cannot see. John saw it, and rejoiced. One day we too will see it, and rejoice. But for now, we are saints under attack. Under the attack of Satan, who hates us; and under the attack of even our own flesh, which rebels against us and seeks the easy way. It is a time of tears and great tribulation, John said. It is a mourning, hungering, thirsting, impure, proud, and strife-filled time, Jesus said. It is hard. Hard to be a Christian. Hard to stand firm and take what Satan dishes out. Hard to believe when so many around us are shouting at us to disbelieve. That it is foolish to believe. That Christians are weak. That Christians are stupid. But this is not new to our day and age. We’re not the first to be attacked from without and from within. And so today even as we celebrate, we also take courage from the example of all the saints who have gone before us. And we are encouraged by them, as John was encouraged. Yes, John. For when he received the vision which he recorded for us in the book of Revelation, think of his situation … he was in exile on the island of Patmos. all his fellow apostles had already been martyred, many of their successors had been too. The church was under severe persecution, and maybe like the prophet Elijah, John thought to himself, I’m the only one left (1 Kings 19). But then he saw! The great multitude that no one could number! There was Peter, and his brother James, and Paul, and all the rest of the apostles! There was John the Baptist, and some folks that he had taught and buried, in their martyrdom. And there was the Lamb! In the centre! And John knew—where they have gone, he will follow. He is not alone, even in exile. The Lord is with him always, and with all His saints. And so John says to you today—in your struggles, in your trials and tribulations, whatever they may be—you are not alone! As we gather around the Lamb here, we too join the angels and archangels and all the company of Heaven—the prophets, the apostles, the saints of all times and places. We join the saints from our congregation who have gone before us. And we join those saints who each of us knows, but who are unknown or anonymous to the rest of the world. A godly mother. A Sunday School teacher who taught us the Word of God. A friend who confessed the truth and would not leave us alone. A pastor. A person who was just in the right place at the right time … with the Word of life and forgiveness. Forgotten by the world, maybe even forgotten by us—but never forgotten by Christ! They too now make up the vast multitude that no one can count. And we consider: how vast the forgiveness and grace of our Lord, reaching into every corner of the world, into cities and farms, homes whole and broken, into places and onto the streets. For He is the God not of the able, but of the unable and disabled. Of folks like you and me. And our Saviour knows all His saints. You are known by God. You are counted and important. You are being watched over and cared for. By the One who came to this earth and laid down His life for you on the cross. By the One who then took up His life again and ascended into heaven. All this not for Himself, but for you. That you too may be with Him. But while we look forward to the life of the world to come, and the rest and joy and peace of Heaven, that does not diminish the reality of our life here on earth, as if all of this were unimportant. No! Actually, just the opposite. It makes our life here even greater. For as our Lord left John on Patmos, the only apostle not be martyred, so He has left you and me. To be His saints for others. Anonymous and unknown to the world, maybe. But not unimportant to our Saviour. For through you He speaks His Word of forgiveness. Through you He speaks His Word of faith and promise. Through you He provides for the wants and needs of others. Through you He shows the hope that we have in Christ. That others too may wash their robes and make them white in the blood of the Lamb. Washing in a baptism that washes more than just skin, but washes away sins, making saints out of sinners, and giving life to the dead. And so we are blessed! As Jesus said. Even as we suffer here for a while. For we know that our suffering is not pointless, nor in vain, but that we are on a pilgrimage—through this world of sin; and the dark valley of the shadow of death. There is no way around it. No bypassing it. Jesus didn’t say to us: Join me and I’ll show you a way around death. No. He’s the only way through it. On our own, we stand no chance. But in Him we are safe. And so in Him you are blessed, no matter what comes in this world. Whether it be sorrow or joy or the mundane everyday tasks of life. For He has come into this world—and comes still. For you. His presence here for us is no less real than His presence in Heaven. His presence here for you. And so we come and receive Him. His washing, His forgiveness, and now His body and blood. That you may cling to Him who clings to you, and will not let you go. For He has called you by name, and you are His. Not a nameless face in the crowd, but a dearly loved child. Not a saint by deed, but by the blood of the Lamb, who hold you in His nail-pierced hands until the day you too will join the wondrous host, arrayed in white. Not a new reality, just in a new place. When what is now hidden will then be revealed. A home on the other side of the veil, with your Saviour. Who as He fills our mouths with His body and blood, and with faith and forgiveness for the journey, also fills our mouths with His praise. And so, we continue to sing our Praises … we do so with these words, “Blessing and glory and wisdom and thanksgiving and honour and power and might be to our God and Lamb forever! Amen.” We also join our song with the song of the angels: Holy, holy, holy! Lord God of power and might … hosanna in the highest! (Sanctus: Isaiah 6) With them and they with us. One voice. For we are all one body, one Church, around one God, and one Saviour. All His saints. All in Christ. Now and for ever. Amen.